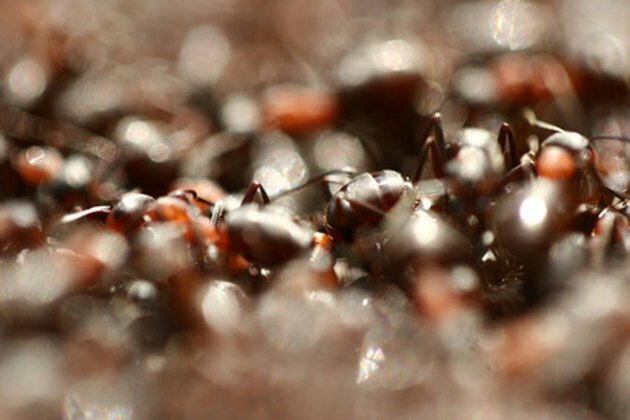 Ants aren't just the storied villain of every cartoon picnic; these common pests eat through garden plants, infest kitchen cabinets and cause painful or itchy bites. Pesticides, perhaps the most common form of ant repellent, present a double-edged sword – they may kill ants, but they also affect plants and food. Sonic – actually ultrasonic – ant repellent devices, as well a their counterpart electromagnetic devices, provide a non-toxic alternative to common pesticides. Ultrasonic ant repellent devices are safe to use around kids and pets. Most ultrasonic ant repellers are small devices that derive their power from electric wall sockets. Unlike pesticides, sonic ant repellent devices do not kill ants. These devices, also known as "repellers," use ultrasonic or electronic waves – the latter of which are known as electromagnetic waves – to repel insects. Ultrasonic repellers output a peak of about 105 decibels of dense sound waves, usually running in a variable cycle. Though these waves are mostly silent to the human ear, pets and people with high-frequency hearing may be able to detect some sound output from ultrasonic ant repellers. The sound does not travel through floors, ceilings or walls. The majority of ultrasonic ant repellers use a high-pitched sound undetectable by the human ear to repel ants, spiders, rodents and other insects. Electromagnetic repellers, however emit an electromagnetic field; manufacturers claim this field wards away ants and other pests. Companies such as Black and Decker, Harbor Freight Tools, Emerson, Sunbeam, Viatek, and Bell and Howell offer numerous ultrasonic pest repellent devices. Some are only about 3-to-4 inches tall and hang from wall sockets while others are standalone box-shaped devices, usually about 6 inches wide and 3 inches deep. Home improvement warehouses, garden centers and online retailers commonly sell the varying types of ultrasonic ant and pest repellent devices. At 2011 prices, these devices range in cost from about $10 to $25 each. These pest control devices cost an average of about 25 to 30 cents worth of electricity per month to operate, according to sonic pest repeller manufacturer Safe Home Products. Ultrasonic ant repllers and ultrasonic pest repellent devices in general have faced a long history of skepticism. Researchers from the University of Florida, the University of North Dakota and the University of Maryland, among others, all deem the devices ineffective. Jack DeAngelis, Ph.D. and former entomologist at Oregon State University, claims that sonic ant repellent devices have "not been thoroughly tested and in fact have failed to do what they claim to do in the few scientific trials that have been conducted." Conversely, manufacturers claim that no evidence exists to dispel the effectiveness of sonic pest repellers. Do Electronic Sound Machines Work to Repel Rodents?